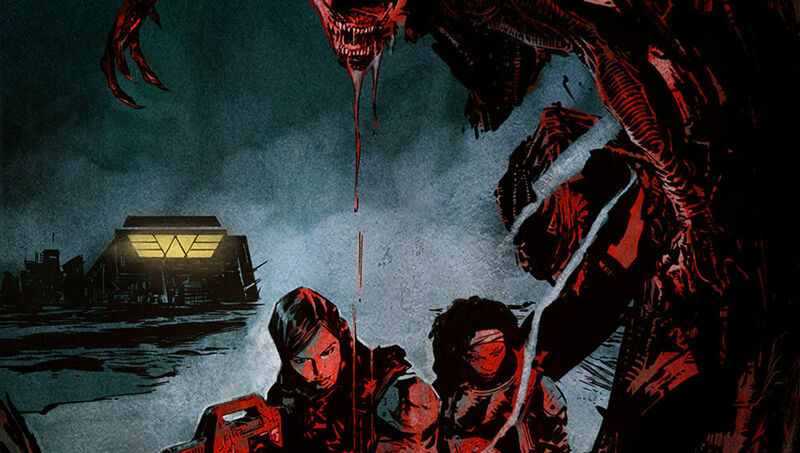 Aliens: Resistance #1 Review – AiPT! Weyland-Yutani may get exposed and shut down their diabolical plans to weaponize the Xenomorphs. Warning: Spoilers for Aliens: Resistance ahead. Aliens: Resistance #1 from Dark Horse Comics is out this week, the first in a four-part miniseries sequel to the 12 issue maxi-series Aliens: Defiance. Where Defiance focused mainly on Zula Hendricks and her rogue synthetic companion Davis’s mission to stop the Weyland-Yutani bioweapons program, in Resistance she finds herself teamed up with her friend Amanda Ripley (Alien: Isolation) to help her expose Weyland-Yutani once and for all and shut down their diabolical plans to weaponize the Xenomorphs. The issue starts out with Ripley hiking to try and clear her head of the events on Sebastopol Station. Zulu shows up and talks Amanda into joining her and Davis, on a mission to investigate a Weyland-Yutani black-site suspected of engaging in human experimentation with the Xenomorphs. In preparation for their mission Amanda and Davis infiltrate a Weyland-Yutani tower to gather intel on the location of the secret research facility. As Davis is extracting the data, Amanda is stopped and questioned by three new-gen Weyland-Yutani synthetics. The situation gets heated as one of the synthetics tries to take Amanda in for questioning. Zula comes to Amanda’s aid and fires a missile from her ship, blasting a hole in the side of the complex and incapacitating the three androids. As Ripley makes a run for the new hole in the wall and leaps out to Zula’s ship, she is clipped by an acid round from one of the downed synthetics. Zula flies off out of Weyland-Yutani space to safety and patches up Amanda’s wound. The two enter cryosleep and using the colony transport ship Gaspar as cover to escape orbit undetected. Amanda wakes up from her cryosleep with an intense case of claustrophobia just as they are approaching the research facility. While they get their bearings, they realize that the Gaspar, which was supposed to be heading to a colony, has made the journey with them. Upon further investigation, they come to the frightening realization that out of the 1,100 colonists that departed onboard the transport they are now showing zero life readings. What is even more disturbing is that the ship’s manifest has been erased and the Gaspar has been reclassified as a resupply only. The issue ends as with the two heroines getting ready to make their way to the research center to investigate what is going on there, as well as what has happened to the missing colonists. The writing on this issue isn’t bad, it’s just not great either. Brian Wood is an incredibly talented writer and his story and dialogue on the previous Defiance series was superb. In this first issue however, the story seems very sparse and the dialogue one-dimensional. The characters feel like they’re just there and there is no real sense of setup or lead into the story about to unfold. Whether intentional or not there are also large gaps with not much going on narratively that gives the feeling that something is missing. It is not until 2/3 into the issue that things start to gel and pick up a bit. This is by no means a horrible story, but in the context of an opening issue in a limited series that only has four issues to tell the entire story, it fails to hit the mark. It does little if nothing to introduce the characters to the reader or to define the relationship between Amanda Ripley and Zula Hendricks. Robert Carey’s artwork on this issue feels stark, desolate, and void of emotion. This is not a bad quality for a title such as an Aliens title, however, coupled with the lack of story definition and meaningful dialogue it does nothing to further help push the story along as far as the narrative is concerned. There are some exciting and interesting action sequences such as Amanda’s rescue and escape from the synthetics at the Weyland-Yutani facility, and we do get a few cool glimpses of the Xenomorphs towards the end of the issue. Dan Jackson’s brilliant use of color is most definitely a saving grace and silver lining to this issue, but overall the entire thing feels empty or incomplete. It will be interesting to see how this is story picks up in the following issues since there are only three more left to tell the story. Aliens: Resistance is an okay issue that fails to deliver on a couple of points. Overall this is a mediocre issue from some extremely talented creators. The first issue in a four-part limited series should grab the reader's attention, define the story and the characters within it, and move the story forward in a way that is compelling and builds anticipation by the end of the issue for the next ones to come. Unfortunately this first installment does little to none of that. A slow-moving story that feels like parts are missing and that doesn't really pick up or get exciting until the very end of the issue. Now #5 review: No more clever titles — read this series already!